The Maya were the first, and only, Native American people to invent a complete system of writing. They wrote their symbols were also carved on buildings, painted on pottery and inscribed on precious stones. Maya writing used glyphs and also picture-signs that represented sounds. The sound-signs could be joined together – similar to the letters of our alphabet – to spell out words and to make complete sentences. These symbols represent some of the names of the 20 days from the farmers’ calendar. The 20 days made one month, and there were 13 months in a year. These symbols were combined with a number from one to 13 to give the date, such as “Three Vulture.” Days were named after familiar creatures of everyday things, such as the lizard or water. Each day also had its own god. Children were often named after the day on which they were born. Thin card, ruler, pencil, scissors, white acrylic paint, large paintbrush, water pot, eraser, tracing paper, acrylic paints, palette, selection of paintbrushes. Draw a rectangle measuring 39½ x 10in onto the piece of thin card and cut it out. Cover the rectangle with an even coat of white acrylic paint. Leave it to dry. Using a pencil and ruler lightly draw in four fold lines, 8in apart on the painted card, as shown above. This will divide the card into five equal sections. Carefully fold along the pencil lines to make a zigzag book as shown in the picture above. Unfold the card and rub out the pencil lines with an eraser. To decorate your codex you could trace or copy some of the Maya codex drawings from these pages. Alternatively, you could make up your own Mesoamerican symbols. Paint your tracings or drawings using bright acrylic paints. Using the Maya numbers on this page as a guide, you could add some numbers to your codex, too. 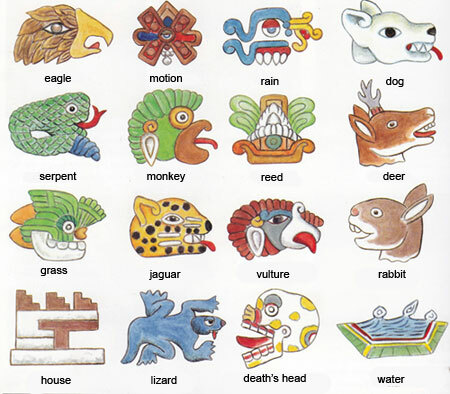 If you went to a Maya school you would find out how to recognize thousands of different picture-symbols. You would also be taught to link them together in your mind, like a series of clues, to find out what they meant. The Maya number system used only three signs – a dot for one, a bar for five and the shell symbol for zero. Other numbers were made using a combination of these symbols.